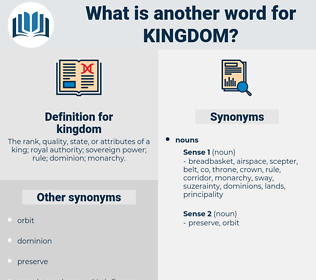 What is another word for kingdom? Undertakings, jobs, enterprises, institutions, counterparts, Businesses, reasons, Forms, units. combined, compounded, joined, bonded, linked, unified, reunited, merged, coupled, attached, tied. uk, kingship, realm, empire, SAUDIS. God grant that you may sit by the side of Christ in the kingdom of Heaven! It is for use only between you and me, when we are alone in our own kingdom, with the world shut out. Kingdom Monera, Kingdom Protoctista, prokayotae, Kingdom Animalia, kingdom fungi, plant kingdom, protoctista, fungus kingdom, Kingdom Plantae, animalia, kingdom Prokaryotae, fungi, mineral kingdom, monera, plantae, animal kingdom. 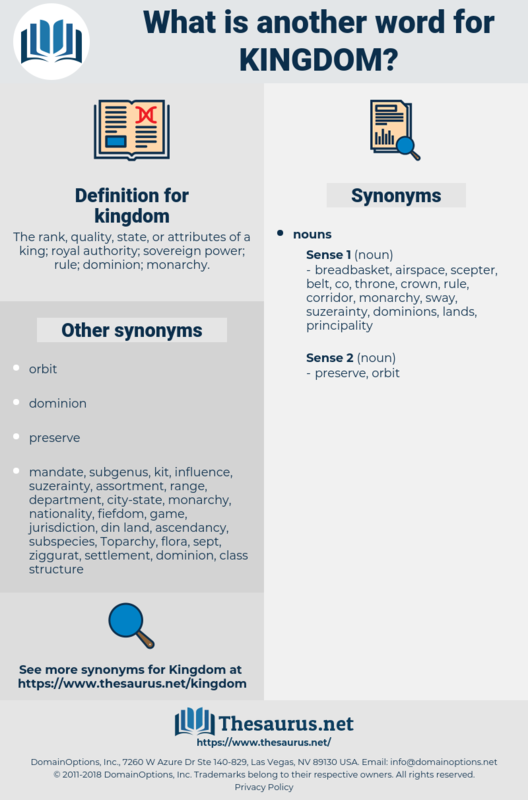 monarchy, group, taxon, taxonomic group, taxonomic category, grouping. domain, area, field, orbit, sphere, arena.